Their departments include laundry & washing, computing, audio, TV and home appliances to name a few. 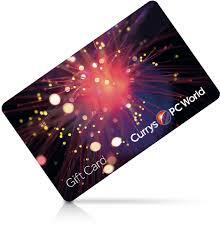 The Gift Voucher can be spent at Curry's & PC World, giving the recipient the perfect amount of choice. All of our stores offer a huge range of electrical good including mobile phones, computers, televisions, domestic appliances and much much more. Please call 1890 400 001 for opening hours or directions to any of our stores. Currys - Unit 156, Blanchardstown Retail Park, Dublin 15. PC World - Unit 407, Blanchardstown Retail Park, Dublin 15. Currys - Unit 15, Liffey Valley Retail Park, Clondalkin, D22. Currys - Unit 51, Liffey Valley Retail Park, Clondalkin, D22. PC World - Unit 14, Liffey Valley Retail Park, Clondalkin, D22. PC World - Unit 9, The Park Way, Carrickmines, Dublin 18. PC World – Unit 15-17, Jervis Centre, Dublin 2. Currys – Level 3, Unit 930B, The Square, Tallaght, D24. Currys – G7, The Pavillion, Shopping Centre, Swords. PC World - Unit 11, Airside Retail Park, Swords. PC Business World - Unit 11, Airside Retail Park, Swords. Currys – Unit 3, Blackwater Retail Park, Navan. PC World - Unit 4A, Blackwater Retail Park, Navan. PC World – Unit D, Newhall Retail Park, Jiggins Town, Naas. Currys - Unit 6, Mahon Point Retail Park, Cork. Currys – Galway Retail Park, Hedford Road, Galway. PC World - Unit 5-6, Well Park, Commercial Estate, Galway. Currys – Unit 2, Park Way Retail Park, Dublin Road, Limerick. Currys – 67 William Street, Limerick. PC World - Unit 5B, Park Way Retail Park, Dublin Road, Limerick. Currys – Unit 1A, Sligo Retail Park, Dublin Road, Sligo. PC World - Unit 8, Sligo Retail Park, Dublin Road, Sligo. PC World – Old Bowling Alley, Cork Road, Waterford. PC World – Unit 18, Retail Park, Inner Relief Road, Dundalk. 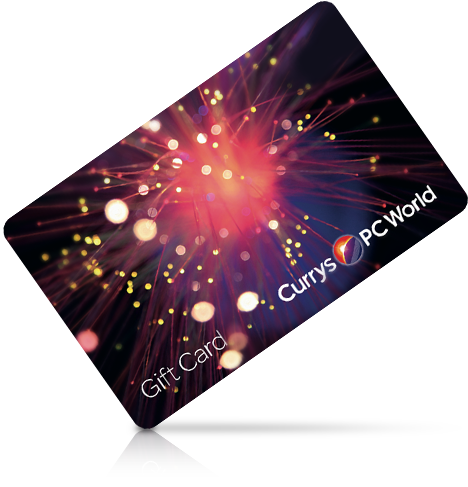 Currys eGift Cards are sent by email, normally within 3 working days.